Lemon meringue pie is an old fashioned lemon dessert that's always a huge hit! The tart lemon filling is contrasted with perfectly fluffy meringue and flaky homemade pastry crust. It might sound hard to make this classic dessert from scratch, but don’t worry—with this recipe, you can make it as good as Grandma can! Admittedly, I was always daunted by the task of making lemon meringue pie. It seemed so tricky, with so many aspects that could go wrong! Fortunately, it’s not as hard as it seems. Follow the recipe and tips below to make a perfect lemon meringue pie from scratch! When was lemon meringue pie invented? No one is sure of the exact year when lemon meringue pie was invented, but it was sometime during the nineteenth century. Lemon curd had its roots in the Medieval age, and meringue was invented in the 1600s. Whoever combined curd, meringue, and pastry to make lemon meringue pie was a genius! Where is lemon meringue pie from? Wikipedia states that the earliest lemon meringue pie recipe was invented by Alexander Frehse, a nineteenth century Swiss baker. Other people say that the chefs of English botanist Emile Campbell-Browne invented the dessert in 1875. Whatever its origins, lemon meringue pie is a long-lived and delicious dessert! Is lemon meringue pie healthy? It’s an average calorie pie at 400 calories per slice, and contains more protein and vitamin C than a lot of other desserts. Like most desserts, it contains carbs and fat. If you’re watching your nutritional intake, feel free to take a smaller slice. For more nutritional information about this recipe, please check the nutrition facts at the end of the recipe card below. Does lemon meringue pie need to be refrigerated? It’s okay to keep lemon meringue pie at room temperature for the first few hours after it’s baked. Once the pie has fully cooled, refrigerate it until you’re ready to serve it. Leftovers will keep refrigerated for 2-3 days. Store it in an airtight cake carrier or cover tightly with plastic wrap. Can lemon meringue pie be frozen? It’s not recommended to freeze lemon meringue pie. You can blind bake the pastry shell and freeze it until you need it. Just make the lemon filling and meringue and put it in the pre-baked shell. Why is lemon meringue pie runny? Did you cook the filling until it was thickened? It’s crucial to bring the filling up to the boiling point to activate the cornstarch. Whisk occasionally to prevent lumps form forming. Eventually, you’ll feel resistance on the whisk along the bottom of the pot; soon, lumps appear in the mix, and then the whole filling is thickened. Be patient! Did you add the egg yolks? Egg yolks give the lemon filling its bright yellow color in addition to thickening it. Gradually whisk the runny filling into one or two extra egg yolks, then pour back in the pot and cook until thickened. What causes lemon meringue pie to weep? Undissolved Sugar. Make sure that all the sugar has been incorporated into the egg whites. No sugar granules should cling to the whisk or the edges of the bowl. Help avoid this problem by using caster sugar (a finer-grained white sugar) instead of granulated, and adding the sugar in the center of the bowl when you’re whipping the meringue. Underbaked Meringue. Bake the meringue for at least 25 minutes. If it’s browning too quickly, cover loosely with a sheet of aluminum foil and lower the oven temperature by at least 10-25 degrees. Pulling the pie out too soon will result in weeping. High Humidity. A lot of people say that high humidity causes meringue to weep. Where I live, it’s very humid all year round, so I can’t really avoid this. You can still bake a delicious meringue pie on humid days! Separate the eggs while they’re cold from the fridge. Trust me, it’s so much easier! Make sure absolutely no egg yolk gets into the whites. Even a trace of egg yolk will prevent the egg whites from reaching their full volume when whipped. Use fresh eggs with thick, globby whites. Test an egg’s freshness by putting it in a bowl of water. If it lies on its side on the bottom of the bowl, it’s fresh. If it stands on end or floats to the top, it’s no longer good for meringue. Also, thin, watery egg whites aren’t good for meringue. Make sure the egg whites are at room temperature. Cold egg whites don’t get as much volume as room temperature ones. Need to warm the whites up quickly? Place a bowl of egg whites inside another bowl or pan of fairly hot tap water for 10 minutes, stirring occasionally. Be careful not to get water in the egg whites! Use a sparkling clean and dry, grease-free bowl and whisk. Just a bit of grease in the bowl will keep the egg whites from increasing in volume as much as they should. Stay away from plastic bowls, as they can still be greasy even after washing. Don’t skip the cream of tartar. It stabilizes the meringue, helping it not to weep when it’s baked. Don’t have cream of tartar? Substitute 1/4 teaspoon of lemon juice or distilled white vinegar per egg white. Whisk slowly at first until foamy, then increase the speed until soft peaks form. Lift the whisk from the mixture to form a peak. The tip of the meringue should fold over softly on itself. Add the sugar to the center of the mixing bowl a tablespoonful at a time. Adding the sugar too quickly can ruin the meringue. Once you’ve added all the sugar, whisk until stiff peaks form. Lift the whisk from the mixture to form a peak. The tip of the meringue should stand up straight without curling. Be careful not to overbeat! Don’t let it sit too long before using. The longer the meringue sits, the more it deflates. Why does the meringue shrink away from the crust? Egg whites naturally shrink as they bake. To prevent the meringue from separating from the crust, make sure that the meringue touches the pastry all the way around the pie. First step: blind bake a 9-inch pastry shell. (I forgot to get a photo of the pastry shell. Sorry about that!) Go ahead and measure out the ingredients for the lemon filling–it will make the whole process much easier. Leave the egg whites out until they’re at room temperature. Grab some caster sugar and cream of tartar. Whisk the egg whites in a clean bowl until soft peaks form, then add the sugar a tablespoonful at a time. Keep whisking until stiff peaks form. This means that the tip of the meringue should stand tall without curling. Grab the lemon filling ingredients that you measured earlier. Break up the egg yolks in a large bowl. Pour the remaining filling ingredients into a medium saucepan and set over medium heat, whisking frequently. The mixture will look thin and cloudy at this point. Keep whisking until the mixture thickens, about 6 minutes. At first, you’ll notice little clear globs floating in the mixture, and then it will suddenly thicken. Be patient! Remember the bowl of egg yolks? Slowly whisk a couple big spoonfuls of the hot lemon mixture into the egg yolks. Then, slowly pour all of the lemon mixture into the egg yolks, whisking constantly until smooth. Pour the mix back into the pan and heat until big bubbles burst on the surface, whisking constantly. I like to pour the lemon filling through a sieve to catch any lumps. Don’t forget to stir in the lemon zest and butter after you sieve the filling! Pour the hot filling into the blind-baked pastry shell. Right away, spread the meringue on top of the hot filling, making sure that the meringue touches the pastry all the way around. Bake at 325 F for 30 minutes, until the meringue is beautifully browned. Let cool completely at room temperature, then refrigerate. Use freshly squeezed lemon juice instead of the bottled kind for the best flavor. Don’t have caster sugar? Just grind granulated sugar in a blender or food processor until fine. Prep the filling ingredients before you start. It makes the process so much easier! Put the meringue on top of the lemon filling while it’s still hot to seal the two layers together. Want a more tart filling? Just decrease the sugar to 3/4 cup (150g). Chill the pie before slicing for the cleanest cut and best taste. Looking for more lemony goodness? You’re in the right place. 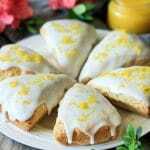 Easy Glazed Lemon Scones: these tender scones are topped with a tangy lemon icing. 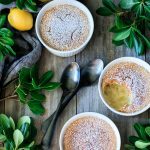 Tangy Lemon Pudding Cakes: each individual cake gets a miraculous pudding layer underneath when it’s baked. Homemade Lemon Curd: the perfect tangy topping for scones, toast, and cakes. The pleasure of a 5-star review for this lemon meringue pie recipe would be greatly appreciated. Lemon meringue pie is an old fashioned lemon dessert that’s always a huge hit! The tart lemon filling is contrasted with perfectly fluffy meringue and flaky homemade pastry crust. It might sound hard to make this classic dessert from scratch, but don’t worry—with this recipe, you can make it as good as Grandma can! Roll out the pastry to 1/8 inch thick on a lightly floured surface. Line a 9-inch tart pan or pie plate with the pastry, then prick the base with a fork and line with parchment paper. Fill the pastry case with dried beans or rice. Bake the pastry at 400 F for 10 minutes, then remove the paper and beans and bake for another 5-10 minutes, until the pastry is a nice golden brown around the edges and the base is cooked. Let the pastry case cool in the pan on a wire rack while you’re making the meringue. Go ahead and measure out all the lemon filling ingredients before you start the meringue. You don’t want to keep the meringue waiting any longer than necessary, as it will lose volume as it sits. Start the meringue by dumping the room temperature egg whites and cream of tartar into a clean, grease-free bowl. Whisk with a stand mixer or hand mixer on medium speed for a minute, then raise to medium-high speed and beat until soft peaks form. Add the sugar a tablespoonful at a time, trying to dump it in the center of the bowl so it doesn’t cling to the edges of the bowl. Whisk until stiff peaks form. Check it by pulling the whisk out of the mixture; the tips should stand tall without curling. Set aside the meringue while you make the filling. Break up the egg yolks in a large mixing bowl. Pour the water, lemon juice, sugar, cornstarch, and salt into a 2-quart saucepan and set over medium heat. Whisk occasionally until the mixture has thickened, about 6 minutes. Slowly whisk several large spoonfuls of the cornstarch mixture into the egg yolks, then slowly pour in the remaining mixture. Pour the mix back into the saucepan and cook over medium heat, whisking frequently, until the mixture is thickened and has large bubbles on the surface, 1-2 minutes. Remove any lumps by pouring the lemon filling through a sieve set over a bowl, then stir in the butter and lemon zest. Pour the hot filling into the blind-baked pie shell. Immediately spread the meringue onto the hot lemon filling, swirling it decoratively with an angled spatula. Make sure the meringue touches the crust all the way around, or it will shrink back when it’s baked. Bake at 325 F for 30-35 minutes, until nicely browned. Let the pie cool completely on a wire rack, about 2-3 hours. Remove the pie from the pan if you’re using a loose-bottomed tart pan, then refrigerate the pie for 4 hours in the fridge to fully set. Serve in slices. Don’t have cream of tartar? Substitute 1 teaspoon of lemon juice or distilled white vinegar. The pleasure of a 5-star review on this lemon meringue pie recipe would be greatly appreciated.